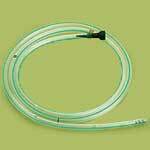 We are recognized among the overriding Ryles Stomach Tube Manufacturers and suppliers in India. The tube is made up of excellent quality materials with radio opaque line that facilitates in the x ray visualization. The Disposable Tube Ryles is also marked so as to ensure accurate placement in the respective applications. The standard length of the Ryles Tube is 105 cm and 120 cm for stomach tube length. Customers are also facilitated with the availability of the ryles tubes in sizes ranging from 8FG to 20FG as per the requirement and application. For Nasogastric introduction for nutrition and aspiration of intestinal secretion. Soft and kink resistant tubing with frosted surface. Marking 50,60,70 cms from the tip for accurate placement.